Are your students overgeneralizing their models? After working exclusively with proportional relationships for the last month, are they describing every new relationship as proportional? This isn’t a task, or a lesson, or anything of that scope. It’s a resource, a provocation, one that gives students the chance to check their assumptions about what’s going on. Play this video and pause it periodically, asking students to decide for themselves, and then tell a neighbor, what’s coming next. 10 marbles weigh 350 grams. So 20 marbles should weigh how much? I’m curious which students will say the answer is less than, exactly, or more than 700 grams. I’m curious which students will say it’s impossible to know. That will be surprising for some. Now invite them to speculate about 30 marbles. 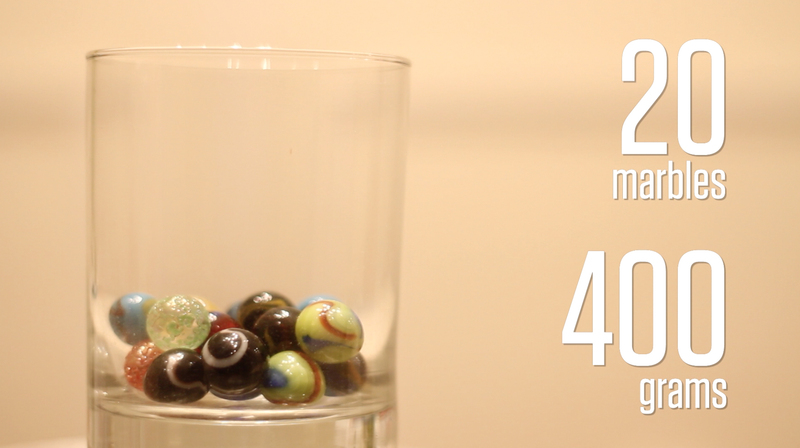 40 marbles. And 0 marbles. Let me end with three notes. First, my thanks to Kevin Hall who had the fine idea for the video and encouraged me to make it. I’ve never met Kevin. That’s the kind of internet collaboration that makes my week. Second, the stacking cups lesson offers a similar moment of dissonance. Can you find it? What I seek is neither calculators and computers as educational technology nor as technological education but as a powerful to arouse and increase mathematical understanding. I always like creating a proportional reasoning speed bump by giving these types of questions. • the way it’s not clear in the still images whether we are being shown the mass of just the marbles or the mass of the marbles + the glass together (the brief shot of the balance scale with the glass on it at the beginning of the video wasn’t doing it for me). So I made a video! Here! It was shot on my phone using a jar of cumin to stabilize, so it could certainly be professionalized. Give an algebraic function whose graph has one positive root, a negative y-intercept, and an asymptote at x = -5, if that’s possible. If it’s impossible, explain why you can’t. Maybe the student can determine the function. 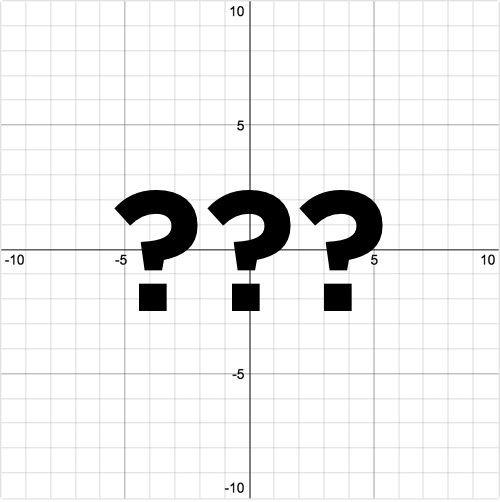 At some point, an advanced algebra student should determine the function. But what do I learn from a student who can’t determine the function? What does a blank graph tell me? The student might understand what roots, intercepts, and asymptotes are. She might understand every part of the task except how to form the function algebraically. I won’t know because I’m asking a very formal task. This is why a lot of secondary math teachers ask a less formal question first. They ask for a sketch. Sketch a function whose graph has one positive root, a negative y-intercept, and an asymptote at x = -5, if that’s possible. If it’s impossible, explain why you can’t. Think of what I know about the student that I didn’t know before. Think of the feedback that’s available to me now that wasn’t before. Desmos just added sketching into its Activity Builder. That was the result of months of collaboration between our design, engineering, and teaching teams. That was also the result of our conviction that informal mathematical understanding is underrepresented in math classes and massively underrepresented in computer-based mathematics classes. We want to help students express their mathematical ideas and get feedback on those ideas, especially the ones that are informal and under development. That’s why we built sketch before multiple choice, for example. I’m stating this commitment publicly, hoping that one or more of you will help us live up to it. Two examples from my recent past. Why did we invent the skill of combining like terms in an expression? Why not leave the terms uncombined? Maybe the terms are fine! Why disturb the terms? Put it on an opener. The expression simplifies to x2, giving students an enormous incentive to learn to combine like terms before evaluating. When students first learn to graph points, the parentheses are the first convention they throw out the window. And it’s hard to blame them. If I told you to graph the point 2, 5, would you need the parentheses to know the point I’m talking about? No. You can’t even easily tell if there are an even number of numbers! The need for combining like terms is Harel’s need for computation and the need for parentheses is Harel’s need for communication. I can’t recommend his paper enough in which he outlines five needs for all of mathematics. My point isn’t that we should avoid real-world or job-world applications of mathematics. My point is that for some mathematics that is actually impossible. But that doesn’t mean the mathematics was invented arbitrarily or for no reason or for malicious reasons. There was a need. Math sometimes feels purposeless to students, a bunch of rules invented by people who wanted to make children miserable thousands of years in the future. We can put students in a place to experience those purposes instead. We explored these ideas in a summer series.